With a family name as esteemed as Chanel’s, actor and musician Alma Jodorowky is the perfect match for Karl Lagerfeld’s lust worthy Haute Couture creations. On the other end of the line, Alma Jodorowsky is apologising profusely, “I have a cold. I’m sorry.” Even with a cold complete with stuffy nose, Jodorowsky still sounds like the epitome of French cool that musicians write loving ballads about and modern poets allude to in their sonnets. A woman of formidable talent, Jodorowsky was caught on our radar when she first aligned with Chanel nearly four years ago after being cast by Karl Lagerfeld for the Little Black Jacket exhibition. “We had tea in Coco Chanel’s apartment, it was very fancy but at the same time very casual, all the girls are really really nice,” she mentions casually, as if tea with Lagerfeld in hallowed Chanel spaces is an every day occurrence. We wish. Besides her ties with one of the world’s most reputable fashion houses, Jodorowsky won’t limit herself to being just an exceptionally pretty face, “I didn’t really plan on being a multi-disciplinary artist, but it’s my way of expressing myself.” Having a family so entrenched within the film and theatre world (her grandfather is cult avant-garde cinema guru, Alejandro Jodorowsky), it makes sense for her to have started by ticking the acting box. Now with Blue is the Warmest Colour, Kids in Love, and a French television show under her belt, she is now ticking off the next item on the bucket list, “Right now I’m focussing more on the music, because I also have a band, we released an album last week actually.” Named after one of My Bloody Valentine’s discarded original title options, Burning Peacocks comprises of Jodorowsky’s husky french crooning and David Baudart’s musical prowess, resulting in Parisian indie-pop leaving behind all notions of teenage amateur hour. Although Jodorowsky admits she didn’t exactly exude cool from the start. “When I was a teenager I had bands with friends, but it wasn’t very good,” she shrugs. It’s comforting to know that no matter how much je ne sais quoi you attribute to one person, they still have the same hang-ups as the rest of us. “It was very scary for me at the beginning because I was very shy on stage,” she says coyly, but has her unintended stage uniform to thank for some relief. “I’ve been wearing kimonos on stage, so I think that’s going to be our thing. It’s encouraged me to move, to put my arms up to play with the fabric. I think clothes can really help in some situations.” What else is there possibly left for this polymath to do? “I’d really like to direct. I’ve directed three of my music videos for my band, it’s something I really want to continue.” With a creative skill set as proficient as Alma’s, combined with her insatiable appetite for creative justification, we are confident in the next generation of Jodorowsky living up to the family name. 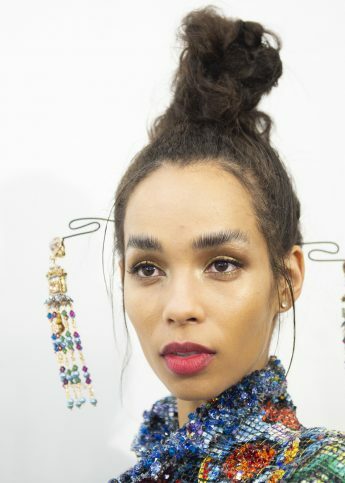 Step-by-step instructions on how to bag the ‘dos from the Paris Haute Couture shows.